A driver was taken into custody Wednesday morning after leading authorities on a pursuit that entered a McDonald's drive-through area in the north San Fernando Valley. 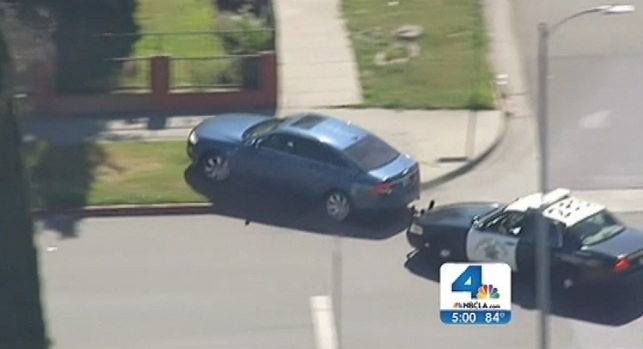 The pursuit involving a man wanted in connection with a vehicle theft was on surface streets -- at times going against traffic -- in the Panorama City area. The minivan driver cut through traffic to enter a McDonald's parking lot, then squeezed past a sport utility vehicle at the drive-through order window. The driver returned to surface streets and an officer used a pursuit intervention technique to send the vehicle into a spin. The minivan stopped on the side of a street and the driver ran from the vehicle, running into a nearby patrol vehicle before officers took him into custody.